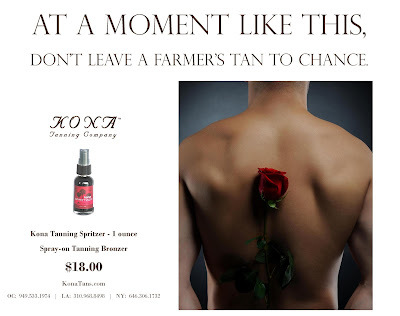 Part of Kona Tanning Company’s sunless tanning product line – A fine mist atomizer containing one ounce of our famous formula, for touch-ups on the go! One ounce never looked so good! Through trial and error in the “Kona Lab,” we have created the finest recipe of tanning solutions on the market. Our exclusive formula is odor‐free, streak‐free, and instantly leaves skin with a radiant mocha glow, lasting about a week. Embrace the tan’s instant confidence lift, as imperfections such as cellulite, varicose veins, bruises, stretch marks, broken blood vessels, tan lines, and scars are minimized or even invisible. This atomizer is fine enough to act as a makeshift airbrush gun, and depending on the skill of the beholder, this may be the ticket to traveling with your very own Kona Tanning Pro! Available in 1 ounce and 4 ounce mist bottles. DHA (dihydroxyacetone) – DHA is a colorless ingredient (derived from beets and sugarcane) that interacts with the amino acids in dead skin cells to produce a brown color change. Caffeine – Caffeine acts as vasoconstrictor, an antioxidant, and a diuretic. For this reason caffeine has been used for years in cellulite creams, because it dehydrates fat cells, making the skin smoother. White Tea Extracts – White tea has been proven to be effective in boosting the immune function of skin cells, protecting them against the damaging effects of the sun. The discovery that white tea extract protects the skin from oxidative stress and immune cell damage adds another important element in the battle against skin cancer. White tea extract also appears to build the skin’s resistance against stresses that cause the skin to age. A virtual tan in a bottle! Clear contents in atomizer by doing an “air spritz,” ridding the nozzle of any excess residue that might compromise the output of the mist. Hold Spritzer six inches from skin, and apply 3-4 sprays of tanning solution. Blend into skin using circular motions, making sure to wash hands thoroughly after application. A blotting cloth can also be used to blend, as solution is water-soluble in most fabrics (see our FAQ’s page to see which fabrics should be avoided). Continue applying tanning spray until desired color is achieved, and avoid coming into contact with liquids for the first 12 hours. Apply as often as desired! Lasts 7-10 days with proper care. Perfect for travel, this self-tanning spray bottle can be used in the air, on land, or at sea. Fits neatly in your makeup kit, so at a moment’s notice you’re ready to tan and go. Busy fashionistas love that the Spritzer is purse-sized, making quick face tans a lunch hour must! Take this self-tanning spray on your next cruise for a mid-vacation bronze, or even use at the end of the trip to return looking rested, rejuvenated, and radiantly golden. Legs looking a little dry? Bring one of these self-tanning sprays home with you, so you’ll never have to bare those legs without a sun-kissed Kona Tan again…wherever you are! For the FACE: After washing and moisturizing your face, dispense two Spritzer sprays into your palms, and massage evenly onto the face and neck. Start with two sprays, and increase as needed – you can always add more color! Don’t forget to wash hands. Thinning hair? If your hair isn’t color-treated, the Spritzer can give the illusion of fuller hair! Several of our clients like to massage their Spritzer’s tanning solution up into their hairlines, which provides a darker backdrop to their seemingly thicker manes.